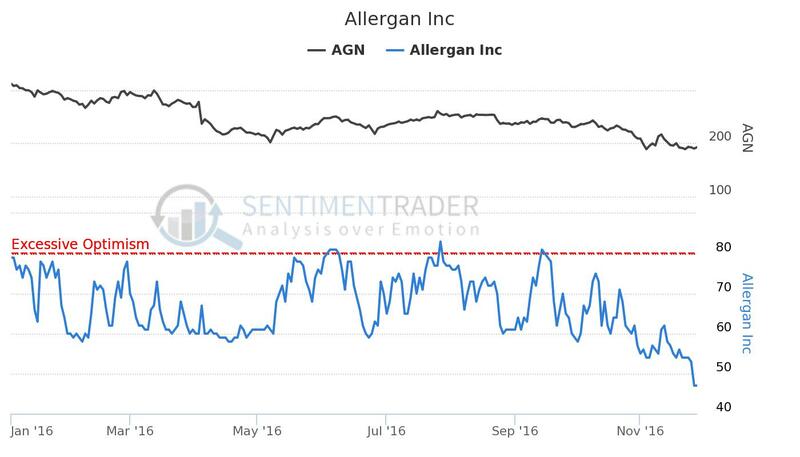 Allergan (NYSE:AGN) is a stock that cant seem to catch a bid at the moment. However I like this company’s competitive advantages and pipeline and still maintain it is undervalued. Here is a strategy to have a bullish bias (without using too much capital) where the probabilities work out. Sell the $187.50/$185 put spread (Expiry January 06) for $0.85. Personally if our timing is off, I would roll this stock out to at least the summer (June) to give yourself time to be right. The roll will result in a credit and would improve the probability of achieving a profit on the initial trade. The buying power used here for the initial trade is $165 and the max gain is the premium received ($85) per contract. Sentiment is on the floor at present and Implied volatility is quite high. This is a good risk/reward setup for short term traders. This entry was posted in Allergan. Bookmark the permalink.